When you see without looking, can you trust what you see? General summary: The theory of physics which scientists since the 1920s believe describes all of Nature, quantum mechanics, says profound things about how we should look at the world. It says that everything is uncertain until it is observed, and that observation inevitably alters reality. For nearly a century, scientists and philosophers have tried to come to grips with what this really means. In the 1990s, Lucien Hardy proposed a paradox which seemed to support the idea that one could never reliably make inferences about past events which hadn't been directly observed. Quite independently, from the late 1980s up until the present day, Yakir Aharonov's group had been developing a new way of thinking about measurements that suggested just the opposite. Until recently, it seemed impossible to carry out Hardy's proposal in practice, let alone to confirm or resolve the paradox. We have finally been able to do so, and to apply Aharonov's methods to the problem, showing that there is a way, even in quantum mechanics, in which one can quite consistently discuss past events even after they are over and done. One of the great mysteries of quantum physics is that it is often interpreted to mean that nothing exists until it is observed; you can not ask through which of two slits an electron went if this is not what you measure. In the 1990s, a technique known as "interaction-free measurement" seemed to promise the ability to "see without looking," as a Scientific American article put it at the time; it was quickly shown by Lucien Hardy that this led to strange logical paradoxes, suggesting that whenever you try to reason about the past in such a fashion, you will be led into error. We have experimentally implemented Hardy's paradox, and combined it with Yakir Aharonov's theory of "weak measurement," showing that in Aharonov's sense, one can indeed talk about the past, resolving the paradox. 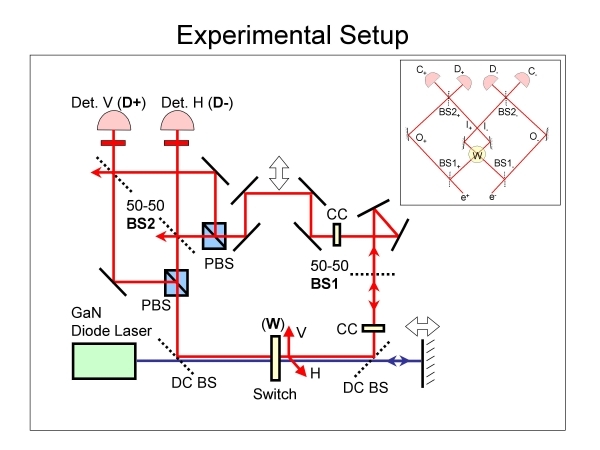 We realized that a "two-photon switch" we had developed for applications in quantum computing would be precisely the key needed to perform Hardy's paradox, which had been a seemingly impossible proposal for over ten years. At the same time, we had been studying how Aharonov and coworkers' concept of "weak measurement" could overturn standard ideas of the limitations on what can be known about quantum histories. Over the course of about two years, we built up a complicated quantum optical experiment and developed new theoretical tools, culminating in this paper, where we show that all the seemingly paradoxical conclusions in Hardy's paradox can in fact be experimentally verified -- and yet, that the use of weak measurement removes the contradiction. Whatever the implications - and Popescu and Aharonov are sure they've only begun to scratch the surface - a new door has opened. Weak measurement should give us a view inside the processes of quantum mechanics that we once thought impossible. It has already uncovered a negative presence that we never knew existed, and there could be plenty more surprises waiting to be found. Eventually, Aharonov believes, weak measurement may dispel all our present notions of the weirdness of the quantum world. Aharonov claims that when the Nobel laureate Richard Feynman famously pronounced that we can never truly comprehend quantum mechanics, he was "too hasty". "I think people will remove the mystery that Feynman said could never be removed," he says. "You should never say never." Our technical article can be found in J.S. Lundeen and A.M. Steinberg, "Experimental joint weak measurement on a photon pair as a probe of Hardy's paradox," Physical Review Letters 102, 020404 (2009). A book chapter I wrote about the issues of postselection in quantum mechanics in general, including the proposal for this experiment, can be found at Speakable and Unspeakable, Past and Future, A.M. Steinberg, in SCIENCE AND ULTIMATE REALITY: Quantum Theory, Cosmology and Complexity, ed. John D. Barrow, Paul C.W. Davies, and Charles L. Harper, Jr., Cambridge University Press, 2003.